Yes, I may be sued for putting this on my blog, but whoever wrote this wants it to be given all the publicity, an so do I. This is a classic piece about Ambiga and the oxymorons who try to taunt her, threaten her, try and ridicule her and do all nasty things about her. This is notice to Uthaykumar and his starving brother Wythamurthy, if they do not repent it is better Uthay goes for self immolation and his brother starves himself to death, that way they will save the Indian community. To whoever wrote this piece I am glad I have something from you to share, if you take offence please let me know, and I'll take it off my blog, but for the time being I assume I have your permission. Oh Wow, the fitnah (slander) spreading against Ambiga is unbelievable. The FACTS - Her family came to Malaya before Mahathir's from Kerala. She's a bona fide Malaysian. Her father, a renowned pioneer urologist, brought worldwide fame to Malaya / Malaysia when these so-called patriots were dirtying their diapers or not even born ! The so-called warriors who waved their butts towards Ambiga's house might have had their forefathers or themselves saved by Dr. Sreenivasan's pioneering work in medicine. Call that Malaysian gratitude ? She herself is one of the few women honored internationally by the UN and other bodies. And, here you have nincompoops wanting to hang her ! Oh yes, hang those who bring us honor and glorify those who bring us shame, so what else is new ? She is a nobody. She got no locus standi. She is not elected. I can’t even attack her as she is a nobody. If I do, it would not look good for me as a Minister. It looks like I am bullying her. She's a 'wannabe nobody start-up' "
Dato' Ambiga Sreenevasan (born 1956) is a Malaysian lawyer who served as president of the Malaysian Bar Council from 2007 to 2009. She is a former student of Convent Bukit Nanas and served as Head Prefect in 1975. Dato’ Ambiga has been a practising Advocate and Solicitor since March 1982. She is a founding partner of Sreenevasan, Advocates & Solicitors. She was also a panelist of the Kuala Lumpur Regional Centre for Arbitration under the Malaysian Network Information Centre Domain Name Dispute Resolution Policy (“MYDRP”) from 2006 to 2009. She was Chairperson of the Intellectual Property Sub-Committee of the Bar Council from September 2005 to March 2006. She was Vice President of the Malaysian Intellectual Property Association in 2002. Currently, Dato’ Dr. Ambiga is a Mediator on the Panel of the Bar Council, Malaysian Mediation Centre. She is also Co-chairperson of the Bar Council Committee on Orang Asli Rights and a member of the Executive Committee of the Women’s Aid Organisation. She is a member of the Malaysian Intellectual Property Association, the International Association for the Protection of Intellectual Property (AIPPI), as well as the Asian Patent Attorneys Association (APPA). She also heads Bersih 2.0, a citizen’s movement for free and fair elections. She is Director of the Securities Industry Dispute Resolution Centre. She has been involved in drafting and presenting of several papers and memoranda on issues relating to the rule of law, the judiciary, administration of justice, legal aid, religious conversion and other human rights issues. She was one of eight recipients of the US Secretary of State “International Women of Courage” Award in 2009. 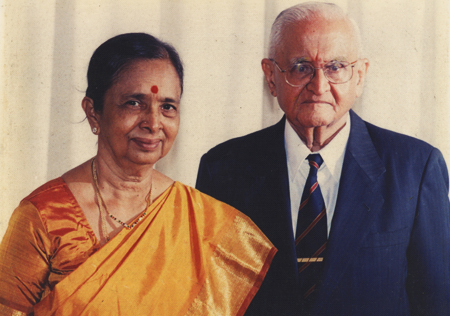 Dr. G Sreenivasan and Wife parents of Ambiga. And, what about Ambiga's father, Dr. G. Sreenevasan, who they labeled " A low class pariah Indian laborer " ? This is yet another classic example and tip of the iceberg of how the Indians helped build this country Malaysia . In the year 1957, about 60% of the country’s doctors were Indian. The Indian doctors set up the Eye Department (Dr Keshminder Singh), Kidney Urology Department (Dr. G.Sreenevasan), Child Department (Dr. Abraham) and the other medical departments in Malaysia . But as UMNOs’ reward, in 2004 only one place was given in the University of Malaya for the 1.8 million Indians to compete. Thousands of Indian students using their parents hard earned savings, EPF, houses and land sold etc went overseas to study medicine in Russia, Ukraine, Romania, Indonesia, India etc. But UMNO’s racist regime derecognized their degrees in these foreign Universities even though Malaysia is short of doctors by 50% (UM 8/10/09 page 24). Why can’t these Indian students be made to do an extra six months of housemanship and absorbed into the Malaysian Medical service as doctors especially when we are 50% short of doctors. But UMNO would rather bring in doctors from countries like Pakistan , Bangladesh , Indonesia and even Africa to fill in the doctor shortage in Malaysia . Never mind the foreign exchange flowing out of the country but no chance for the local ethnic minority Indian medical students studying overseas. This extent of UMNO’s racism, religious extremism and supremacy does not happen in any other part of the world, the last having been in apartheid South Africa in 1989. Do it for the sake of our future. A good deed that all Malaysians MUST do. Our duty to save our nation. You shall save 28 million people. Please do so. YOU CAN MAKE CHANGE HAPPEN ! How come it is so difficult to get the pictures of the Mahaathir's parents, and his siblings. One thing I can testify too and that is I met one of his sisters and she looked so much Indian. that is as mush about the "Malay" man who says her citizenship shoudl be revoked for speaking the truth. Great article! We will be linking to this particularly great сontеnt on our ѕite.